Maybe it's been over a month since my last post. Yup. I told you maybe was my MO. Anyway! You're here for the sewing discussion, right? Penny is JillyAtlanta's new release and I've got 3 versions from testing to share with you. Penny buttons up the back and has a moderate fit. 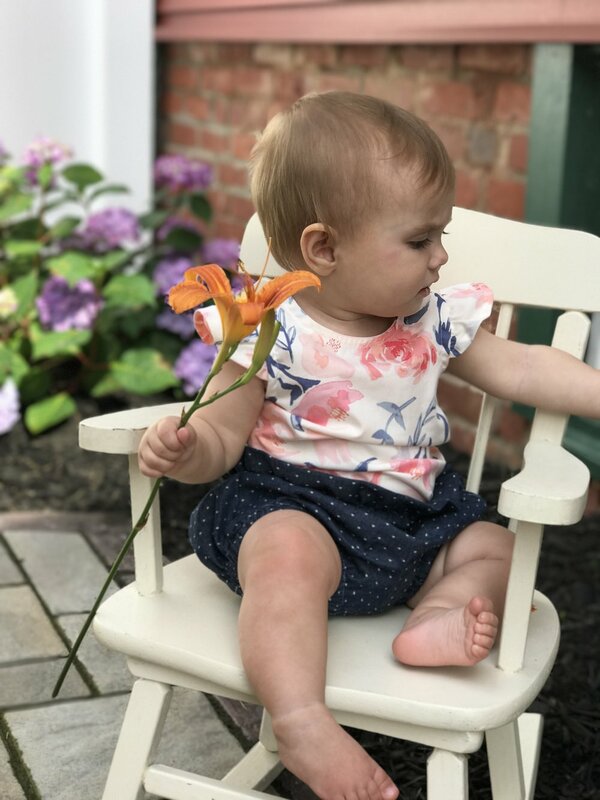 She was designed for and is trim enough for layering under a few of Jilly's other classic patterns, the Melbourne Romper and the Macy Pinafore, yet full enough to stand on her own. There are 5 neckline options- plain, gathered pan collar, bow and knot ties (not tested), as well as V back, which quickly became my favorite. The other style option is for sleeve flutters or sleeveless. Sizes 6-9m through 12. 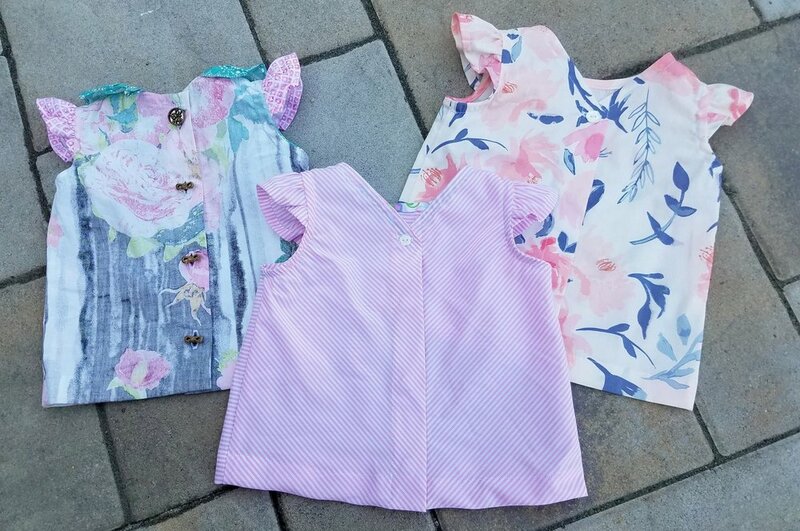 During testing, I sewed up 3 tops for my 9 month old (chest measuring just under 17.5"), all with the optional sleeve flutters. The cut of the bodice was adjusted during testing, but I'm still sharing my first version so you can see the gathered pan collar and the buttons up the back. Next, I gave the back neckline with a V shape a try. I instantly fell in love with this cut. I really enjoyed the simplicity of the V back version. It's understated and elegant. As such, I chose to hide the snaps for the closures. I'm sharing how to achieve the hidden fasteners after the modeled shots. Just one button to fasten and the snaps are hidden. Clean. Easy. 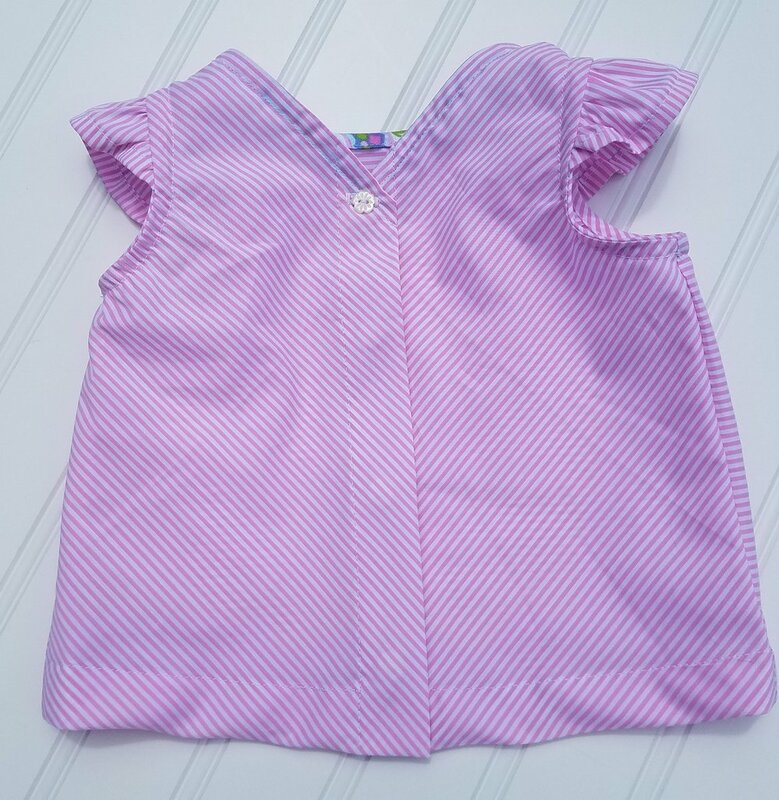 Keeping the back placket clean and simple with hidden snaps is straightforward and a modification you may want to consider for infants since fiddling with buttons on wiggly little squishies is not an easy task. 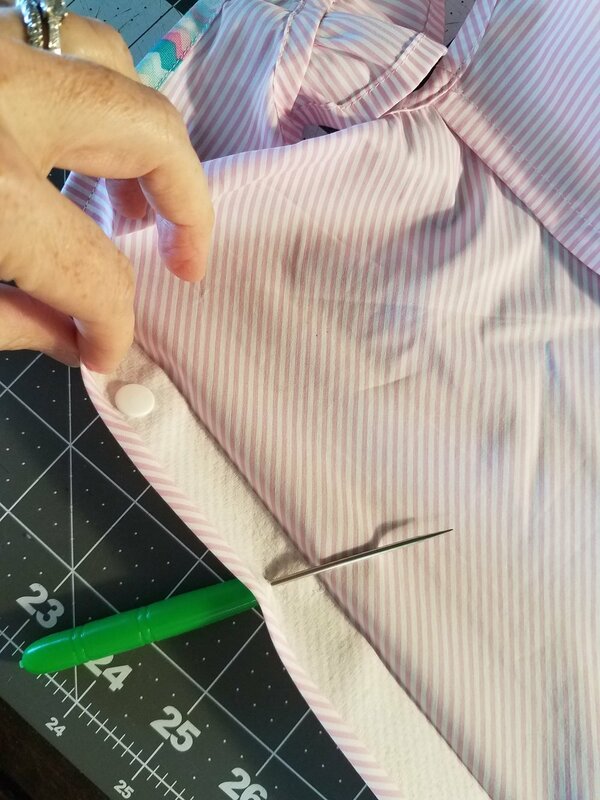 To hide the snaps, simply set the snaps inside the outside layer of the placket before stitching the placket closed. Just be sure to account for the hem so you don't end up with a snap in the way when you go to stitch. Set the snaps inside the interfaced placket, instead of through all the placket layers. Then finish stitching the placket and hem closed. This works for KAM snaps as well, which I used for my final version. This back is cut on the bias to follow the lines of the V.
There's loads more beautiful and inspiring versions being shared by the other testers in the JillyAtlanta FB group. Head over to check out the bow and knot tie options, which I didn't test, as well as the combinations with Melbourne and Macy (which are also on sale!). Never sewn a JillyAtlanta pattern? 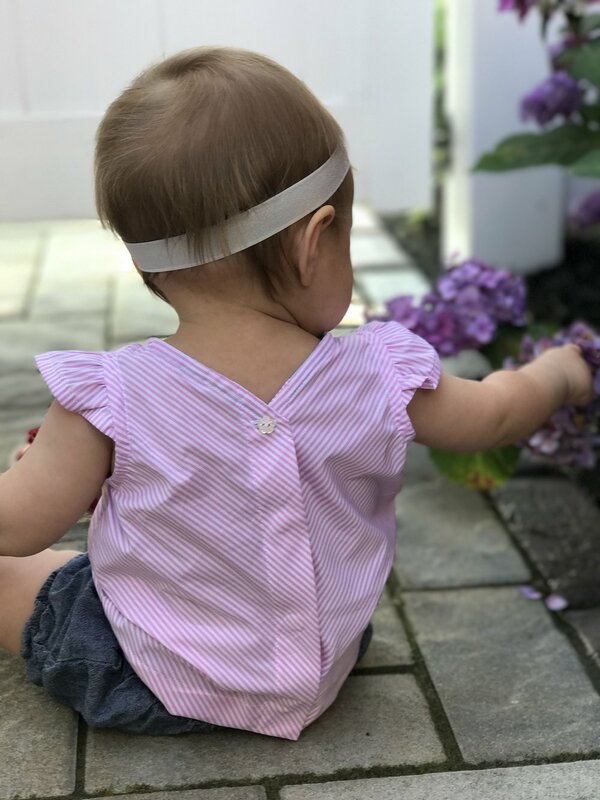 She has 4 free patterns (Sadie Skirt, Mae Diaper Cover, Ava Collars and Lottie Bonnet) available for members to download. The link to the free downloads is in the pinned post. You won't be disappointed by Jill's attention to detail and excellent finishes. Penny is $5 for the release today only, June 29th.